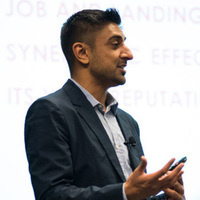 The LMU MBA Alumni Association & LMU MBA Student Association are organizing a special networking workshop featuring author, speaker and career coach Jaymin J. Patel. Jaymin will break down the often intimidating topics of networking and interviewing. He will share tips and tricks collected from dozens of MBAs and industry professionals on their journey to get their dream job - including his own personal successes and failures as an MBA student and recruiter. Don't miss this dynamic workshop that provides step-by-step direction on how to network and interview like a rockstar!